Über lange Jahre arbeitete die Künstlerin an Installationen und Bildern, die Fundstücke aus dem Alltag und nicht alltägliches zusammen fügten. Inspiriert durch die intensive Beschäftigung mit dem poetischen Werk von Emily Dickinson. Die neuesten Arbeiten von Barbara Penn zeigen sie in veränderter Ausdrucksweise. Politische und sozialkritische Themen sind dominant. Dabei wurde der Malträger Leinwand durch die PVC-Plane ersetzt. 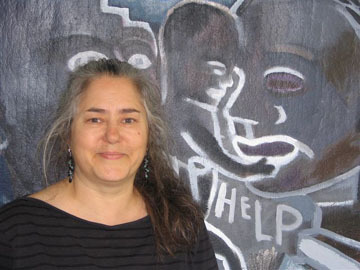 Barbara Penn is currently Professor of Art in painting, drawing, and combined media at the University of Arizona, having joined the faculty in 1991; (MFA University of California, Berkeley (1986). Penn uses literary and poetic sources in her paintings and combined media installations and considers personal and socio/political themes. Solo exhibitions include the Gallery A, Chicago; ARTEMISIA, Chicago; Gallery Paule Anglim, San Francisco;Galerie Napela, Berlin, Germany, Tucson Museum of Art, University of Arizona Museum of Art, and Studio Lo-do Contemporary Arts Gallery, Phoenix, AZ. Group exhibitions include Basel/Miami International,FL 2002),Conversations from My Heart, Educational Alliance, NY (2001), Language as Object: Emily Dickinson and Contemporary Visual Art, Mead Art Museum, Amherst, MA (1997) and Farbe Gold, Dekor * Metapher * Symbol, the Obere Galerie im Haus am Lutzowplatz, Berlin, Germany (1992). Penn was awarded a fellowship to Skowhegan School of Painting and Sculpture in 1985 and Artist Residencies--La Ruche, Paris (2000)Hydra, Greece (1998), Julin, Poland (1998,1996), Millay Colony for the Arts, NY (1990), Yaddo, NY (1990). Recent work appears in Art in America (December 2002) and in New American Paintings, Open Studio Press, vol. 42, Boston, MA (2002). Raphael Rubinstein and John Villani, Report From Arizona, Not a Mirage--The Downtown Phoenix Gallery Scene, J. Villani, Art in America, NY, New York, December 2002, p. 44-45. Elaine Paoloni, Six Emerging Artists speak "From the Heart", NEW YORK RESIDENT, March 13, 2001, Vol. 13, No. 38, p. 18. Penn and Penkalski, Two Different Worlds, Half-hour interview, TV POLAND, Branch in Rzeszow, Poland, March 27,1998. Zbigniew Rybka, Rzeszowski informatior Kulturainy, Marzec-Kwiecien ... Szajua (Ga1eria).,,Bfizniemu Swemu...98", Rzeszow, Poland, March, 1998, p. 21. Magdelena Zurad, Noc Arlystow, Kolejna Edyqfa Akcji,, "BlizMemu Swemu..." GAZETA WYBORCZA, March 27,1998, pp. 1, IV, V.
Leslie Epperson, Interview for Scottsdale Center for the Arts Exhibition, Letters from Home: Collaborative Identities, ARIZONA ILLUSTRATED, Channel KUAT, Tucson, AZ, January 22, 1998. Emily Dickinson Edited by Gudrun Grabher and Cristanne Miller, University of Massachusetts Press, 1998, p. 406. Making Worlds, Gender Metaphor, Materiality, Edited by Susan Hardy Aiken and others, Front and Back Cover Design from Installation Shot, University of Arizona Press, 1998. Elizabeth Schmidt, Imagining Emily, BOOKEND, THE NEW YORK TIMES BOOK REVIEW, New York, NY, March 2, 1997, p. 3. Maryanne Garbowsky, Language as Object. * Emily Dickinson and Contemporary Art, EMILY DICKINSON INTERNATIONAL SOCIETY BULLETIN, Lexington, KY, May/June, 1997, pp. 1-2, 13. Steven Meckler, Photographer, Tucson A by Steven Meckler, Black Spring Books, Tucson, AZ, 1996, p. 30.
ako Takeda, Noah Henshu Kobo, (Noah Publishing Studio), Osaka, Japan, 1996, pp. 261-263. Charlotte Lowe, Exploring the Mind's Corridors, TUCSON CITIZEN, Tucson, AZ, September 21, 1995, p. 15. Margaret Regan, Female Space, TUCSON WEEKLY, Volume 12, # 24, Tucson, AZ, August 2430,1995, p. 35. Michael Boyle, Interview for Dinnerware Artists' Cooperative Gallery Three-Person Invitational Exhibition, ARIZONA ILLUSTRATED, Channel KUAT, Tucson, AZ, August 22,1995. Anke Sterneborg, Sprachverwirrung, (Austellungsprojekt, Under the Name Babel), A Confusion of Language, (Exhibit Project called Under the Name Babel), DER TAGESSPIEGEL, Feuilleton Section 5, # 13 834, Berlin, Germany, March 27,1991. Renee Schipp, Der Turmbau zu Babel im Spiegel zeitgenossischen Kunstschaffens, (The Babylonian Tower as Reflected in Contemporary Art), BERLINER MORGENPOST, Berlin, Germany, March 12,1991. ART 1998 CHICAGO AT NAVY PIER, Chicago, IL, 1998. BLIZNIEMU SWEMU'98, Rzeszow, Poland, 1998. LANGUAGE AS OBJECT, EMILY DICKINSON AND CONTEMPORARY ART, Mead Art Museum in association with University of Massachusetts Press, Amherst, Massachusetts, Essays by Karen Sanchez-Eppler and Susan Danly, 1997.
LETTERS FROM HOME: COLLABORATIVE IDENTITIES, New Directions Gallery, Scottsdale Center for the Arts, Scottsdale, Arizona, Essay by Deborah Hopkins, 1998. XIX OGOLNOPOLSKI PLENER MALARSKI, JULIN'96, Organizatoryzy Pleneru and City Gallery in Rzeszow, Rzeszow, Poland, 1996. JOSTEN, McMAHON, PENN, Exhibition brochure sponsored by Dinnerware Artists' Cooperative Gallery, Arizona Commission on the Arts, Tucson/Pima Arts Council, Tucson Community Foundation, Essay by Rosemarie Bernardi, 1995. ARIZONA BIENNIAL, Tucson Museum of Art, Tucson, AZ, 1995,1993. FARBE GOLD, DEKOR - METAPHER - SYMBOL, Beweggrunde fur Malerei heute, (COLOR GOLD, DECOR * METAPHOR * SYMBOL, Motives for Painting Today), Hard Bound, edited by Ars Nicolai, Edition 2, Kunstlerhaus, Berlin, Germany, 1992. UNDER THE NAME BABEL, Stuttgart, Germany, 1990. HERE AND NOW--RECENT WORK OF THE MIDDLEBURY COLLEGE STUDIO FACULTY, Middlebury, VT, 1990.